Each month we spotlight and interview a new local designer we love right here on our blog! This month, we are featuring the work of Sandra Kathleen Bowling who owns and creates the jewelry line Sandra Kathleen Jewelry. 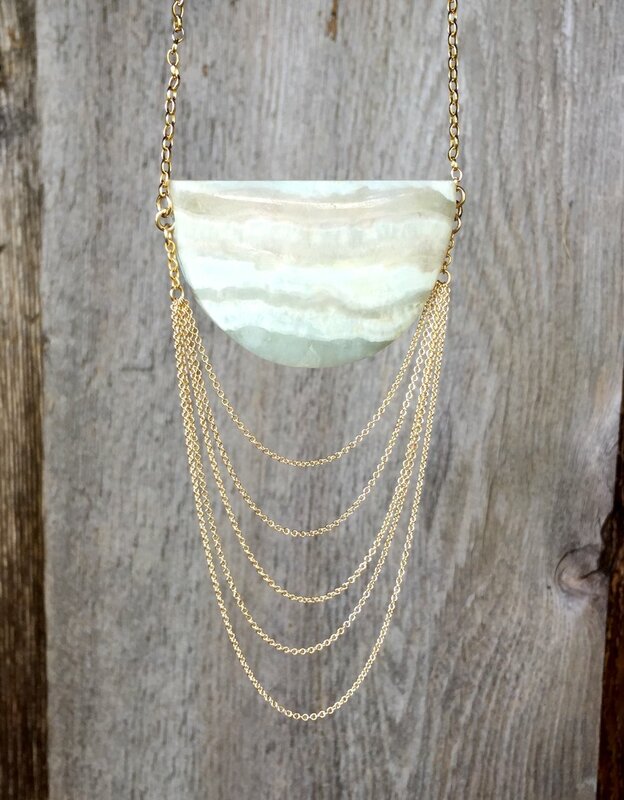 We have been lucky to carry Sandra's jewelry line in the store at different points and are so excited to have her in the shop for a trunk show event on this Saturday, Dec. 3rd, 2016 from 3pm - 6:30pm. We asked Sandra some questions about her business, her love of gemstones, and her favorite things to do in the Bay Area. Read on for more info! How long have you had your business? Tell us the history of how you got started to where you are now. I started making jewelry at age 5 and began selling jewelry while in high school. As an adult, I’ve had a jewelry business on and off with my current chapter having started in 2010. Tell us about your jewelry line and what is involved in a Sandra Kathleen Jewelry piece. 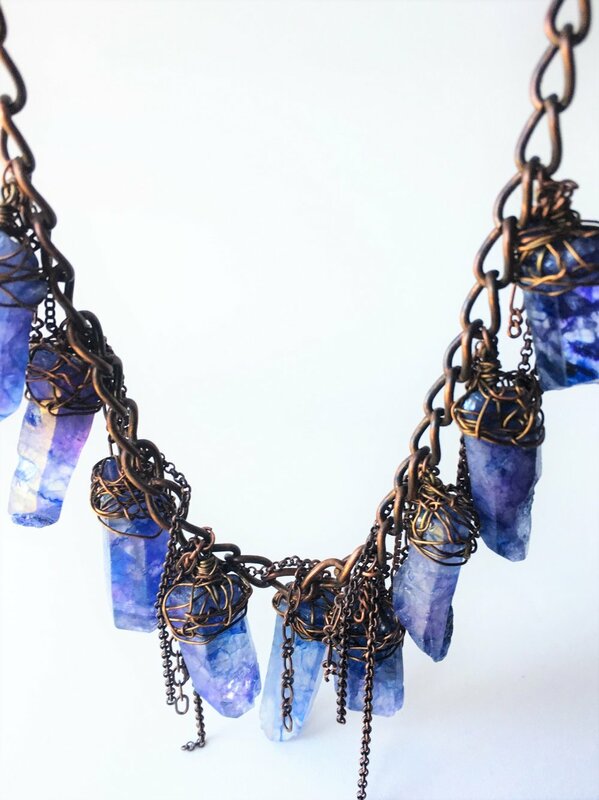 My jewelry celebrates unique gemstones and the beauty and power they hold. I love connecting stones to people, especially when they get that clear feeling of being drawn to a particular stone. I began working with crystals in meditation as a child and have always carried them and worn them to support my personal well being and empowerment. I hope to create jewelry that people wear with intention. There's a co-creation that happens between the wearer and the materials of stone, metal and fiber....being mindful of this jewelry becomes imbued with meaning and promotes your strengths. I am so in love with gemstones, the textures and colors, and feelings I get from seeing and touching them. I love creating simple and well made designs to showcase the stones natural glory. When making custom jewelry I get inspired from feeling and processing what someone is looking for then using my intuition to create a supportive and celebratory piece that best resonates with them. 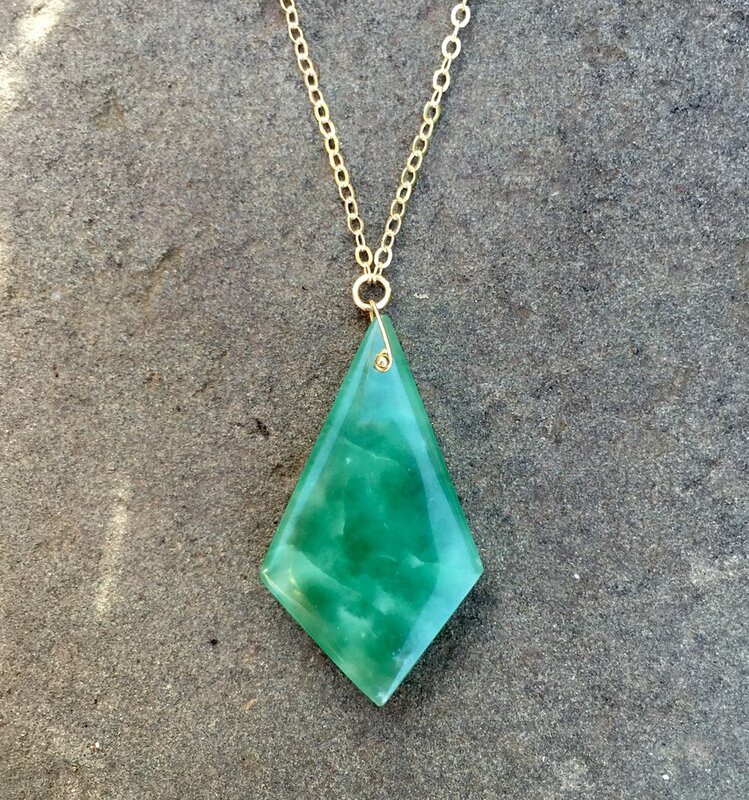 Why do you choose to use gemstones in your pieces? Why are you so passionate about ethically sourced gemstones? Working and collecting gemstones is a life long passion, I've always been fascinated by them and drawn to them. Sourcing ethically is important as there is a range in practices with mining and how the earth is treated afterwords, to how the miners are compensated, whose doing the business. It's my ideal to know at least some of this process and source from sellers who work directly with miners. I will and have paid three times as much for crystals because the sellers re plant the earth post mining. I also am mindful of production and consumption of gems and precious metals and thus produce small amounts of jewelry. Tell us a little about your other job and how your two business are entwined. My other work is in the healing arts as a licensed psychotherapist and a sound therapist/body worker. One of my passions in working in the field of mental health is addressing trauma and emotions on the level of vibration. I am passionate about the flexibility of human nature and consciousness. With sound therapy I facilitate a vibrational body work session that dissipates stagnant and blocked energy/emotions and supports the individuals vitality and sense of well being in their body. It's so fulfilling to provide such a transformational support service. Both my jewelry and work as a therapist and body worker are all entwined with the shared goal of vibrant, empowered living. What do you do for fun and what are your favorite Bay Area spots to visit? I dance as much as possible and enjoy being out of doors, walking, hiking, swimming, camping, hot springs! I also love to connect with family and friends, as I'm from the Bay and all my family is here. Locally, I regularly walk at the Berkeley Marina and also up in the Oakland hills for the redwood trees. I also try to get to both Tahoe and Yosemite regularly and spend a lot of time in both places during spring and summer. I'm super grateful I get to make jewelry and can have a business that allows me to share this love I have. Thanks so much Sandra! We are super grateful you make jewelry as well! (I have several of Sandra’s pieces myself.) Please join us this Saturday from 3pm – 6:30pm and see Sandra’s jewelry for yourself. All of the next photos are pieces that Sandra will have available at the trunk show on Saturday. We will be offering refreshments and 10% off all sales for the day will go to Standing Rock and to help rebuild Mosswood Recreation Center. Follow her on Instagram @sandrakathleenjewelry, facebook, or check out sandrakathleen.com. Sydney Khan, the designer of Tropikali. Each month we spotlight a new designer we love right here on our blog! This month, we are featuring the work of Sydney Khan who owns and creates the jewelry line Tropikali. Sydney has had her jewelry at the shop for a few months now and customers (as well as employees!) love her unique style of bead-work with mixed metal accents. Sydney also works and teaches at Blue Door Beads just down the street from the shop. If you haven't gone into Blue Door Beads, you have got to check out this incredible shop that has all of your jewelry making needs; classes, jewelry repair, and a knowledgeable, sweet staff! We asked Sydney some questions about her business, advice for other new jewelry designers, and Tropikali's upcoming events. Read on for more info! I have been making jewelry for over ten years and have loved discovering new techniques and inspiration along the way! I am self-taught and learned most of my basic skills from my mom and then continued to experiment and explore on my own. I have officially had my jewelry business for about a year now, but have been working up to it for the past three to four years and learning along the way! Working at Blue Door Beads really pushed me to get out there and give it a try. Tell us more about Tropikali. Choosing a name was difficult, but I finally chose Tropikali. I was envisioning a bright and bold contemporary version of the Hindu goddess Kali wearing my jewelry. After diving deeper into what the goddess stands for, I knew I had to incorporate it into my name and logo. Stemming from Middle Eastern heritage. I knew that this name had a deeper meaning and would serve my brand as authentically as the goddess herself. Kali stands for fierce authenticity and revels in the destruction and rebirth of life. My logo is in the shape of a lotus with three eyes (just like the goddess Kali) and these represent the past, present and future. I liked this because it embodies being aware of yourself in your current surroundings and to remain present. Each piece I make is special to me and I hope my brand instills confidence and empowers others to be themselves! I am constantly on the move as a full time student, with a job, internship, and my budding business. I am the most inspired when I take time out of my day to put myself into a timeless bubble and experiment with different jewelry designs. I find that bringing this creative meditation as a daily practice helps me reflect and process the day, while still being able to relax! What are some of your favorite pieces you have ever made? My favorite piece would have to be my first statement necklace made with sea-foam green crystal points with messy wire wraps. The piece was big, bold, and just my style. This is a design which is featured in my collection (see blue crystal necklace in below images). What advice would you give someone just starting out as a designer? My advice is to not give up and to make products that make you happy. Make mistakes, learn from them, and reflect on how you feel during the process. The process is more important to me than the outcome and I think this helps you as a designer to push yourself. It won’t always be easy, but if you challenge yourself and get out of your comfort zone you will continually surprise yourself. Immerse yourself in a creative community where you can collaborate and connect with others. What classes do you teach at Blue Door Beads? I am currently teaching a series of bead weaving classes. I teach a beaded ring class called Peyote Rings (that is the name of the bead weaving stitch), Brick Stitch Studs, and Beaded Triangle Fringe Earrings. I am considering teaching some new classes involving wire work and hammered metal components, which I have come to learn about through some experimentation and are featured in Tropikali. When is your next trunk show event? I will be at Good Omen Market with 35 other amazing local artists on October 22nd from 4pm to 10pm! You can also catch me at First Friday with a friend of mine who makes pottery. Follow @tropikali on Instagram to find the location of these events as well as see Sydney's newest creations! Thanks Sydney! The next time you are in Resurrect check out her gorgeous pieces in person!